It's difficult for any building material to withstand year-round extremes of heat and cold, snow, ice and blistering sunlight. But asphalt-based shingles, the roofing used on four out of five new houses, can take the abuse for 15 years or more. Roofing life spans vary depending on the weight of the shingle, the pitch of the roof, building location, maintenance and other factors, including which trade association you consult. The Washington-based Asphalt Roofing Manufacturers Association (ARMA) says the typical life of asphalt roofing is anywhere from 20 years to 50 years, depending on the product type." That's somewhat optimistic, according to the Metal Roofing Alliance, which says a metal roof lasts 40 to 60 years while "the average life span of an asphalt roof is 12 to 20 years." Your shingles might defy predictions one way or the other. (A lot depends on how they were installed, not only on the materials used.) But the upshot, according to ARMA, is that at least 2 million homes every year need a new roof. The terms can be confusing. You may hear roofers and suppliers say "fiberglass" or "asphalt-fiberglass." But most people still use "asphalt" to describe modern shingles with a fiberglass base mat embedded in an asphalt coating under a layer of mineral granules. Although many different shingle weights and designs can be used on a new house, re-roofing is normally done with lighter-weight versions of a standard configuration, called three-tab strip shingles. The key decision is when to apply them. Ideally, you'll find the one or two-year window of efficiency: not too soon before the existing shingles need help, but not too late when the old roof is too deteriorated to bury. If you miss the optimum window, it's better to be early than late. 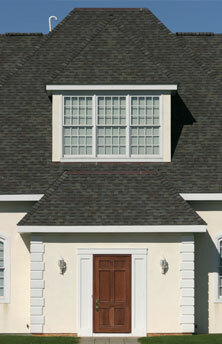 Wait too long and you'll have to strip the entire roof of brittle, broken and waffling shingles and start from scratch. That makes the job more time-consuming and expensive. ARMA says, "If a residential roof is more than 20 years old, it is a prime candidate for re-roofing." Even if you catch the roof in time, there are limits due mainly to concerns about overloading the roof structure. In many areas, building codes do not allow more than two layers -- the original roof and one layer of re-roofing. That's a good guide with or without codes because standard asphalt shingles add about 250 pounds per 100 square feet. A third layer isn't likely to collapse the rafters, but it does use up reserve strength that might be needed to withstand sagging and other problems under unusual loads, such as a heavy snowfall. And, as a practical matter, you can't effectively nail new shingles through several layers of old shingles. One nail would seat solidly in a rafter without compressing the layers, while another would drive down the old roofing, creating a heavily waffled surface -- and maybe leaks. An old roof can be scuffed up and short on surface granules, but to re-roof successfully it has to be reasonably solid and flat. Active dripping is a fairly obvious indicator of trouble. But you might not see small leaks that gradually eat away plywood and timbers in the roof structure. So start the evaluation in the attic, checking the underside of the roof deck for wet spots and stains. Condensation sometimes can confuse the issue. But roof leaks almost always dry with dark rings around the edges like a coffee stain on a tablecloth. The rings come from traces of asphalt, a sure sign that the water came through the roof and not from interior condensation. From the outside, you can walk on low-slope roofs to check the surface. Bear in mind that asphalt-covered roofs heat up on a sunny day (check them morning or evening) and can be easily marred by foot traffic. But you don't have to climb to make an educated guess about re-roofing. From the ground (with binoculars to zoom in on trouble spots), you can spot the major stages of wear. Most shingle roofs follow this four-stage sequence of deterioration. First, surface granules begin to wear away, leaving discolored, blotchy patches that are easy to see on a light-colored roof. On a dark roof, you might need to examine the shingles close up. But you can also check downspout outlets where piles of granules collect. Granule loss doesn't cause leaks. It does expose the asphalt to direct sunlight, which makes the tab sections brittle and more likely to break off. This is usually a good time to re-roof. In the second stage, bare spots increase in number and enlarge in size, and a few of the most exposed tabs may start to curl. There might not be any leaks yet, but you'll need to re-roof soon. In the third stage, the brittle tabs curl more and crack, and you find chunks of shingles on the ground and in gutters. At this point, water can leak in through exposed nail heads. You can still re-roof (just barely) but only after replacing broken and brittle tabs. By the fourth stage, when more tabs have broken off and most of the shingles are curled and brittle, repair gives way to replacement. You have to start from scratch.